The other morning, after dreaming to the tune of the constant patter of rain on the tin roof of my house, I woke early to enjoy a morning stroll through the mountains of northern Guatemala. After an hour or so of watching the mystical dance of clouds caressing the valleys and peaks of the green hills, I began to notice that my right foot was soaking wet. 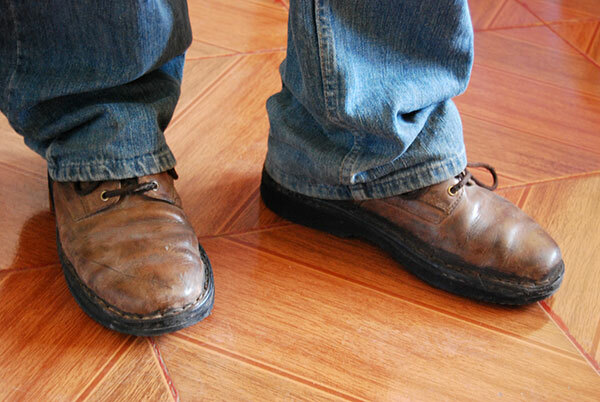 My favourite—and only—pair of shoes, brown Dockers bought at a thrift store a year-and-a-half ago, had finally worn out. With a hole the size of a quarter revealing my blackened sock, I needed a new pair of shoes. As I walked back towards my house with increasingly wet feet, I began to weigh my options regarding how I could get a new pair of shoes in the small town of northern Guatemala where I live. The first option that came to mind was to travel into the capital of Guatemala City to visit one of the many sacred shrines of capitalism and consumer society: the shopping mall. I figured a new pair of shoes at the mall would cost somewhere between $75 and $100, plus the $20 bus fare to and from the city. Another option was to check out one of the many pacas that have invaded this small Mayan town during the past five years. Pacas are small stores usually in the empty back room of someone´s house that sell used clothing sent from the United States. I’m not sure exactly how pacas work, but I imagine the migrant husbands of the women who run them use their day off from their low-paying factory jobs in the United States to visit garage sales or thrift stores in search of cheap clothing to mail back to their faithful wives to re-sell at a slightly higher price, to raise their meagre family income. A pair of “kind of” new shoes at the pacas usually costs between $10 and $20. After I finally made my way back to my house and dried off, I took a look at the hole in my Dockers and realized that, apart from the sole that had worn through, the rest of the shoe was actually in pretty good shape. Thus surfaced the idea of taking my old, brown shoes to the local “shoe hospital.” That’s actually how it’s written on the sign of one of the shoe repair shops. In the small town where I live there are probably 20 shoe repair businesses that specialize in resurrecting shoes that probably should have been laid to rest years ago. I’ve been told that for a new pair of soles the shoe hospitals only charge around $5 dollars. Lastly, there are the kaites, a type of sandal that is locally made from leather and used tires. Older men who can no longer work in the corn fields usually take up kaite-making as a retirement activity and it is actually quite fascinating to watch them filing away at a piece of rubber that used to be a car tire to make a sole fit the size of the shoe they’re making. Kaites cost around $7 to $8 depending on what brand of tire you want. Just kidding. So how was I to choose among these four possibilities? To weigh my options, I sat down to consider the pros and cons of the four alternatives. On the positive side, if I were to purchase the designer shoes from the mall, folks in the consumer-driven world might consider me fashionable, although given my complete ignorance of current fashion, I’d probably have to change my whole wardrobe to fit into that category. Would it really be worthwhile? On the downside, most shoes at the mall are expensive, ugly, not very durable and are made by exploiting child labour all around the world. Plus, one of the thrills of living in Guatemala is that there is always the very real possibility of getting mugged for my new pair of shoes during the six-hour bus ride back to my small town. 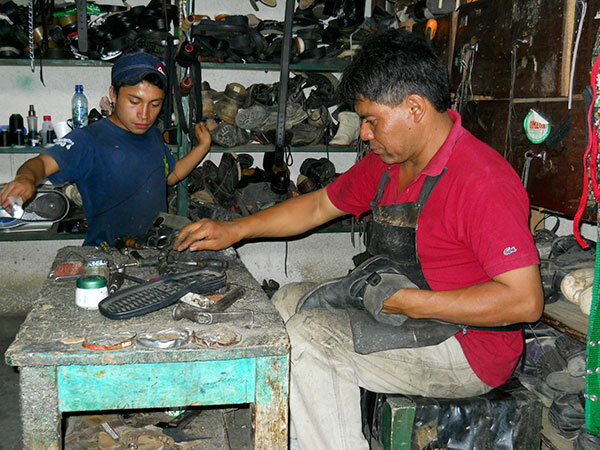 The business of selling shoes from the pacas creates local employment by helping families separated by migration economically maintain themselves. Also, it creates employment opportunities for women who are often abandoned by their migrant husbands, who get sucked into the thralls and temptations of American society. On the other hand, the boom of the pacas in this small Mayan town is partly responsible for the decline in teenage women using the traditional Mayan dress that is made by elderly women patiently weaving beautiful artwork into blouses and skirts, re-telling the story and values of their people on the clothing that women wear on a daily basis. This loss of culture due to competition with the cheap used clothing imported by the pacas made me feel a bit guilty for having as my entertainment the possibility of finding a “cheap-buy” at one of these stores. Additionally, these migrant husbands must be the ones who always seem to find the good stuff at Goodwill just before I get there, leaving me to choose between an XXL and XXXL jacket. Plus, my father always scolded me for buying used shoes and assured me that one day I would end up with a healthy dose of athlete’s foot. The shoe hospitals offered perhaps the most enticing promise: being able to keep my pair of Dockers that, after myriad rainstorms and sloshing through muddy fields, had miraculously moulded perfectly to the shape of my foot. It was also an opportunity to support local workers who were maintaining a trade and a skill that little by little was vanishing into the forced extinction caused by industrialization, globalization and capitalism. Unfortunately, there were a few lingering questions. I wondered about how long the shoe hospital could revive my pair of Dockers for. Would I again be going through this whole thought process about where to get a new pair of shoes a month from now? Also, I was a bit concerned about how to do away with that unpleasant foot odour that permeated my pair of shoes before taking them to some guy who was going to be handling them profusely while trying to piece them back together. Would I have to pay worker’s compensation benefits if he passed out because of my foot odour? And finally, the kaites, a product that is everything that goods from the neoliberal globalized economy are not. They are locally made, inexpensive, innovative and durable, and I knew I would feel good about having some old grandpa measure my foot onto a piece of old tire. The cons are that kaites are only made as sandals, not as closed footwear. In our local mountains, where an occasional frost isn’t out of the ordinary, the very real possibility of losing a toe or two to frostbite could be a consideration. At last, I was confounded. I realized that this simple decision of choosing where to buy a new pair of shoes was, at the same time, an ethical assessment, a probing into where my values resided and what type of worldview was to guide my lifestyle, my consumer choices and my ultimate alliances. Local is community, and ultimately what is good for the local community is good for everything else. Prioritizing what is local should be the centre around which our economic lives turn. Building community is hogwash and meaningless rhetoric if it’s not focused on creating tangible paths toward strengthening the local economy and putting neighbours back in touch with one another. Every economic decision we make will affect the progress or destruction of building community. In my case, the simple decision of where to buy a new pair of shoes had the possibility of either supporting local businesses and trades that are barely surviving the onslaught of competition that characterizes the globalized economy, or funnelling more and more needed resources away from the local community and thus condemning it to its slow demise. But what to do when we’re faced with a consumer decision where there seems to be no opportunity to “buy local”? In the mid-sized town of rural Kentucky, where I grew up, there are probably a hundred stores that sell shoes made by children in China, but I don’t know of one that sell kaites or the equivalent made by local artisans. Another example might be coffee, that indispensable life-giving morning drink that few people are set to do without. I can’t say I’ve ever seen a Kentucky coffee farm, nor probably ever will. The first and most obvious answer to this dilemma is to get to know your community and all that it offers. I no longer live in the mid-sized Kentucky town I grew up in, but during my last visit back, as I drove around the countryside with my father as he visited his insurance clients, I was amazed to find an abundance of local businesses, industries and artisan shops that made, grew or sold everything from blueberry jam and Amish wicker furniture to my mother’s strawberry wine. It was a side of the rural Kentucky economy that I hadn’t seen before and that is inevitably invisible when one limits his economic life to frequenting malls on the strip. It might not be impossible, then, to find some old grandpa making artisan shoes, although I doubt that the soles would be made of used tires. Try as he might, a Kentucky farmer is not going to be able to grow coffee. And try as she might, my mother is not going to be able live without her morning coffee; growing up, we didn’t want her to try. Thus, we’re forced into making an economic decision that is inevitably going to be global. What would it mean, then, to think locally when making the decision of buying a foreign product, coffee in this instance? I am pretty sure that my mother, and most women in Kentucky, would not want to see their children drop out of elementary school to pick blueberries at the local blueberry farm for $3 a day. I’m pretty sure that these women wouldn’t want their children to be exposed to dangerous pesticides as they picked those blueberries, to drink the water contaminated by those blueberries, or to tremble in fear as they saw the approaching owner of those blueberry fields. Yet, at the same time, so many good women in Kentucky condemn other children to that very situation, but in the coffee fields of the big landowners of the part of Guatemala that I live in. I believe that most people are good, decent folks who want to see their community thrive and be healthy. The can of worms with the global economic system we live with, however, is twofold. First, it is pathologically designed to function towards injustice, and injustice brings about the exploitation, destitution and ultimate collapse of local communities around the world, especially in poorer countries. Second, this global economic system does all that it can to make “community” invisible. The vast majority of those coffee drinkers who stop by the local supermarket or coffee shop to buy a kilo of coffee have no idea where their coffee came from, who picked it and under what consequences. Thus, when one is confronted with the inevitability of making a global economic choice, my advice would be to take the time to think about what one would want for his or her own community, and then to question how that far-off community across the world, where this or that product is being produced, is going to be affected. This is not going to be easy, for it requires the determination to discover what is purposely being hidden by the designs of the global economic system. But that is perhaps the price we should be paying to be able to enjoy a hot cup of coffee grown thousands of kilometres away. Of course, no decision is ever crystal clear. Even the decisions we make in our own communities are often complex and filled with doubts and a lack of clarity. There will be debates and questions regarding what product is “fair trade” or “ecological,” or what have you. But if we take as our starting point the sincere desire to treat the far-away communities where our coffee is grown with the same affection and care that we would desire for our own community, then I think we’re on the right path. The international development organization I work for recently set up a retirement fund for all of its international workers. Looking over the paperwork, I tried to understand the ins and outs of the investment program that my retirement fund had set up for me. However, as I am functionally illiterate when it comes to anything financial, I turned to one of my friends and co-workers, a specialist in economic development with an MBA degree and a depth of knowledge about how the financial world turns. His humble yet wise advice was that the retirement program was inevitably founded upon an injustice. For an organization dedicated to fighting against poverty and injustice around the world, I was understandably confounded. My friend explained that, after spending time immersed in the financial world of the Global North and then being exposed to the realities of the poor and marginalized communities of the Global South, he was convinced that the only way to invest with justice was through being attached to a particular place as part of a community that shared in the effects of those investments. Only through belonging to a community could one intimately know and feel what any investment really causes. I think that the same is true not only for our investment choices, but for all of our consumer choices. The impact of the products we consume must be felt locally for there to be an ethical evaluation of the true cost of the effects of our consumption. At the very least, we should make every effort to think locally—to consider what we’d want for our own community—when we act globally. And for my new pair of shoes? I love my old, brown Dockers too much to let them go, so they’re currently on the operating table at the local shoe hospital for $4.50. Tobias Roberts has worked with Mennonite Central Committee in Central America for the past six years. Tobias Roberts models his refurbished Dockers. I can identify with the situation in this story. About 10 years ago I went to a camp near Orillia. One morning while on a hike on the grounds, I stepped on some sharp rocks, which punctured holes in the soles of both shoes. I showed them to one of the councilors and he said they were pretty much a write-off. He looked in the footwear department and found a pair my size and gave me the new pair at no charge. What would I have done with those old shoes when it came time for outdoor activities? The terrane was very rough and rocky and not easy to travel.